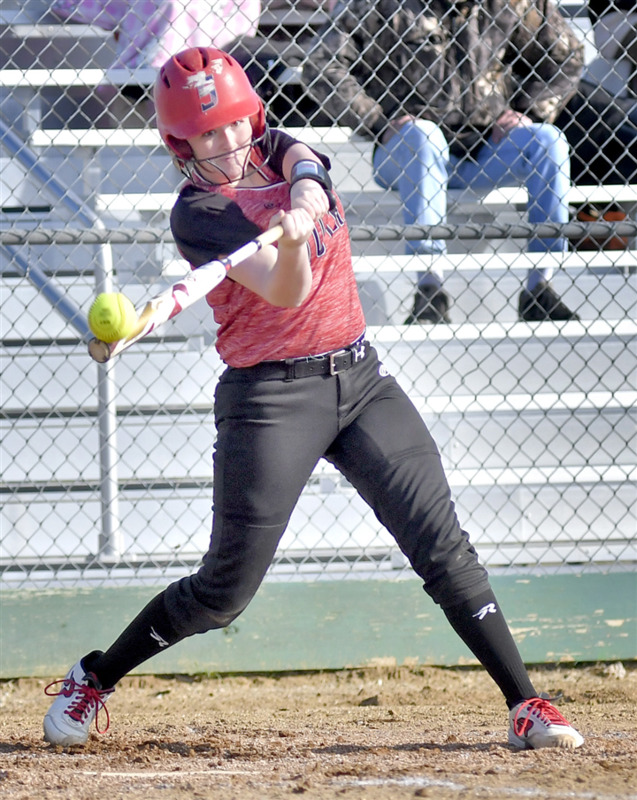 Photo by Gary Nieter, Times-Union Manchester freshman Emma Evans needs every inch of the bat to make contact with the ball during her turn at bat in the first inning of Friday’s softball game with Wawasee. Photo by Gary Nieter, Times-Union Warrior senior Bethany Flannery winds up for a pitch early in the contest. SYRACUSE – After wondering all day Friday if they would play, Wawasee and Manchester’s softball teams contested a thriller of a non-conference softball game that the Warriors are likely to remember for quite a while – and the Squires are glad to put behind them. The game, moved from North Manchester due to wet grounds, saw the Squires score twice in the bottom of the sixth inning, only to see the Warriors score a pair of unearned runs in the top of the seventh to take a 3-2 win. The Warriors scored first in the top of the fifth before Manchester mounted its late comeback. Wawasee had just one extra-base hit, a Marissa Hunziker double, but managed to score just enough for its third win of the season in seven games. Faith Swihart had the game-winning single for the Warriors. Bethany Flannery got the win in the pitcher’s circle, allowing seven hits and striking out a pair of Squires. For her team’s part, Manchester coach Brittany Holmes expressed some frustration with not being able to catch a break. Of the Squires’ seven hits, five went for extra bases. Emma Evans, MacKenzie Day, Kindra Stetzel and Carsyn Howard all had doubles, and Emma Garriott had a triple. But as is often the case after a tough loss, Holmes was focused on what went wrong for the Squires. Holmes was pleased with the pitching performance of freshman Stetzel, who gave up just five hits and one earned run while striking out seven and walking just one in her complete-game effort. But once Wawasee took the late lead, there was no comeback in the cards. Manchester’s doubleheader at Fremont will begin at 11 a.m.
Wawasee will host Triton today, with first pitch also at 11 a.m.